I really like how some things are changing here in the Philippines. Last year, more cities have implemented a ban on plastic bags, charging P2 for every plastic bag, switching to paper bags, and encouraging people to bring reusable bags. It took some time to get used to, but more people are bringing reusable bags now, from what I’ve observed. I’ve also noticed some people taking more interest in organic food, and that would definitely be great for the country’s agriculture industry. More local dairy farms are coming out with products like yogurt, cheese, and ice cream, all locally produced. Brown rice is also becoming more common, though I’d love to see more restaurants offering that option and making sure they get the rice from Philippine farmers. I got a kilo of rice (P50 or $1.22) a while ago from a place near the yoga studio I go to. 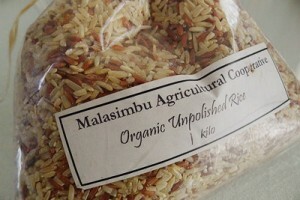 The rice was produced by the Dinalupihan, Bataan-based Malasimbu Agricultural Cooperative. I wish I could find more information about them, but all I’m getting is details from 2009. I hope the cooperative continues to thrive, because such success will encourage more farmers to go organic and hopefully increase the popularity of organic rice in the Philippines. Next Post Support verrrde, an eco-friendly affordable clothing boutique project.